01 WHAT IS YOUR PRICE FOR A WEBSITE? Our website cost and pricing varies and depend on different factors. It’s best to setup up a free consultation to learn about your business needs, goals for your site, and other areas you like help with. We can give you a firm quote base on our discussion. To give you an idea, here is our ballpark pricing. WordPress CMS website starts at $4,800 for a 10 page website. If you need less than 10 pages, we can credit you remaining pages as you add pages after launch or we can start at $4,200 for a 6 page website. We hand pick industry specific SEO friendly templates and customize both layout and page content to fit your needs. This option is most popular since there is good balance for time and budget. With a CMS system, you can edit the content as often as you wish without prior programming knowledge. WordPress CMS custom website starts at $9,600. If you have specific needs where industry specific templates are not viable, we can build it from scratch from the ground up. With this approach, we can fully customize your design without limitation. The following are included with all website packages. You can select the best package based on your needs. 02 HOW LONG DOES IT TAKE TO BUILD A WEBSITE? For a standard website up to 10 pages, typically 4 to 6 weeks. For larger websites, it can be 2 to 3 months depends on complexity. 03 WHAT ABOUT IMAGE LICENSE FEES, PLUGIN FEES, OTHER SUBSCRIPTION FEES? All fees will be included in your website cost estimate unless noted. Our goal is to be clear and transparent regarding pricing, so you don’t have to worry about any hidden costs associated with your project once initiated. 04 CAN YOU HELP ME WITH OBTAINING A DOMAIN NAME? Yes, we can register a domain of your choice. All our website package includes 2 years registration at no additional cost. Search engines favors long-term domain registration and Google has acknowledged that 2+ years domain registration is a trust signal. We will manage the domain for you, but you will be the rightful owner to the domain. 05 WHAT IF I ALREADY HAVE REGISTERED EXISTING DOMAIN NAME? If you are the owner of the domain, we can manage it for you and update any settings necessary to make it work with your site. 06 WHAT HAPPENS TO MY DOMAIN IF I DECIDE TO DISCONTINUE WITH YOUR SERVICE? We will transfer your domain name to a registrar of your choice. The transfer process usually takes from a few hours to 8 days. During the transfer process, we will take steps to ensure that your website is not impacted. 07 HOW MANY REVISIONS CAN I MAKE TO MY SITE? Our belief is to build a quality website that serves its purpose and is pleasing to your customers. We don’t have a hard number on how many changes you can make. Instead we will iterate changes with you until you are satisfied. On average, 2 to 3 iterations are usually enough but we will go through as many rounds as needed until you end up with a website that you are proud of. Unlimited revisions is included with your website cost estimate. 08 WHAT OTHER SERVICES DO YOU OFFER RELATED TO WEB DESIGN? We value long term client relationships and fully support all website projects. We are here to help should you need any improvements or enhancements. We offer complete branding services such as logo design, brochure design, business cards, packaging, and print. We also offer animations, custom fonts, high quality images, and social media integration included in your website cost estimate. We provide full website management service including technical support, hosting and maintenance. 09 DO YOU OFFER COPYWRITING SERVICE FOR MY WEBSITE? Yes, it’s included in our Content Marketing service which will provide the quality content you need. To get the maximum return for your content, we bundle our link building service from authority sites to link to your website for a great organic boost. Note that Content Marketing service is additional to your website cost for building your website. 10 DO YOU HAVE ANY REVIEWS FOR PRIOR WORK DONE? Yes, our reviews are listed here. 11 WHAT ABOUT ISSUES OR BUGS FOUND AFTER SITE LAUNCH? All our completed projects have a 90-days warranty against found issues. We will correct issues free of charge during this warranty period and is included in your website cost providing that the project has not been modified in any way by a third party. 12 CAN YOU MANAGE MY WEBSITE FOR ME? Yes, we offer a full premium website management package which includes the following. Price for this service starts at $100 per month and is additional to your website cost estimate. 13 CAN I UPDATE MY OWN CONTENT AFTER MY WEBSITE IS LIVE? Yes, absolutely. All our CMS based site will allow easy content update without technical knowledge. 01 I WANT MORE TRAFFIC TO MY WEBSITE. HOW CAN YOU HELP? If you want to build brand awareness and drive traffic to your business website, we can help with our SEO service. If you want to generate quality leads to close more sales, we can help you with our Pay Per Click service. If you want engaging content with your audience, we can help you with our Content Marketing service. Applying both SEO and Content Marketing can give you a large boost in organic ranking since Google loves fresh and quality content along with relevant backlinks from authority sites to your website. 02 WHAT KIND OF REPORTING CAN I EXPECT FOR SEO? 03 DO YOU OFFER CONTENT WRITING SERVICE FOR MY BLOGS? Yes, blogging is included in all our SEO packages. You will get 1 blog per month for standard, 2 per month for premium and 4 per month for elite. Generally, 1 or 2 blogs should be enough for most business unless you have special requirements that exceeds this or it’s standard to write many blogs in your industry. 04 I NEED LEADS NOW INSTEAD OF WAITING FOR MY WEBSITE TO BE FOUND IN 6 MONTHS. WHAT CAN I DO? You can run paid Ad campaigns on Google, Bing or Facebook. Our certified AdWords and marketing experts can help you with our Pay Per Click service. 05 DO I NEED BOTH SEO AND PAY PER CLICK AT THE SAME TIME? This depends on your business goals. If you currently already have customers and want to build brand awareness for long term, SEO is invaluable in establishing your real estate in the Internet space. If you need new customers to generate revenue quickly, PPC is excellent in bringing in highly qualified leads to help you close more sales. If you find both services necessary and fits in your budget, go for both services as PPC will help drive additional traffic for SEO. 06 DOES YOUR MARKETING PLANS HAVE LONG TERM CONTRACT? Our marketing plans are billed monthly and there is no long-term contract. We recommend the following time commitment to run your campaigns to see results. 07 IS THERE A SETUP OR ONE-TIME FEE FOR YOUR MARKETING SERVICES? Yes, there is a $2,000 one-time setup fee for all SEO and Pay Per Click plans. 08 WHY DO YOU CHARGE A SETUP FEE FOR MARKETING SERVICES? Digital marketing services are extension tools for your business. To fully maximize your campaigns before launch, we will need time to discover, analyze and research your business in depth to come up with the best strategy to meet your bottom line. Then we need to configure reports and work on immediate actions to get the ball rolling. The one-time setup fee covers this work. 09 HOW LONG IS THE CAMPAIGN PRE-LAUNCH PHASE? Usually it takes 4 to 5 weeks before the ongoing monthly optimization for all our marketing services. 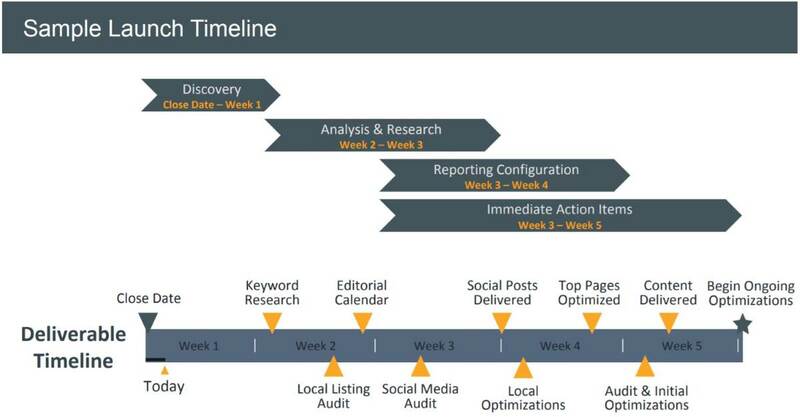 Here is a sample SEO campaign launch timeline.